Summary: Internet Download Manager has performed extremely well in our downloading test by accelerating from two to five times faster than manual download. Its downloading function is as solid as rock with fully automated downloading process from all web browser feature, optional download take over request even if its initialize by application, a helpful scheduler, powerful website grabber, and last but not least FLV video grabber. Internet Download Manager making your downloading process a set and forget task. Overall, a product you should not be without if you are a downloading freak. Pros: Lightning speed download process, lots of fundamental function that a download accelerator software needs, outstanding additional feature of FLV video grabber, and a unique website grabber which is second to none. If you frequently download large files over the internet, you must already know how frustratingly boring it is. Not to mention if your download process are disconnected in the middle of it by any interference be it electricity shutdown, system error, or connectivity problems, you have to start it all over again from the beginning. It is ok if it’s just one file, but how about if you download multiple files with large size? It’s irritating isn’t it? And there is no guarantee the fresh start will not end up just like the previous one. You absolutely need something to make download a set and forget process. For those of you who do not know, there are already download accelerator software available. But to know which one can offer solution to your problem instead of being another problem, you need to do a research. But don’t worry, we will do it for you. Here we review one of the most renowned and the speediest available in the market, Internet Download Manager. Internet Download Manager by Tonec Inc offers a download speed accelerator. Since its first debut in 1999, Internet Download Manager has undergone a numerous update. The latest build, namely version 5.16, has been perfecting the FLV video capture feature since the first introduction back in previous version of IDM 5.15. What is FLV grabber anyway and do IDM truly can deliver what it promised? We will find it out for you. Just sit tight and enjoy the ride so that you can feel the amazing speed of the fastest and smartest download accelerator software in the market. Internet Download Manager is pretty compact in size. It is only 2.68MB in size and only a blink of an eye to be downloaded, well actually not more than five minutes by standard internet connection. Installation process is also straightforward. But at the end, IDM will automatically check your internet connection speed so that it can decide the most ideal setting for it when downloading process. And after the installation process, IDM will start automatically every time your Windows start, it will run in the background, making sure all request to download file from the internet will be taken over by IDM. Function toolbar are all laid in the upper side of the screen. The information window below it is split into two sides just like Windows explorer in which the left side contains folder list of finished and unfinished downloaded file, website grabber, and the files that are still in the queue. The right side will open up each time we click a folder in the left hand side which will reveal files and details of the respective folder. To be honest, there is a contradictory between the ease of use and interface cosmetic of Internet Download Manager. We agree that this is a simple yet effective way to guide you over download process, initialized, and configure it. But we also hope the GUI should be polished more though. The background is too plain with its white, spread-sheet like display. A glossier, Vista-like style would be accepted. And the icons, the icons look absolutely plain. Yes, you could change them with colorful one, available free for downloaded in IDM website, but still, an animated, more stylish icon pack is a welcome. We also wonder why the extra skins are not included in the package? It will of course help the standard set. All of this of course is just an extra wish for an already easy to use interface scenario. But if it’s implemented, it will be superb. Don’t forget, many buying decision are taken from first impression. But hopefully you won’t judge IDM by its cover though. Because it deserves much more than that. Internet Download Manager surprisingly is not your usual internet accelerator software. Yes it gives you a solid accelerator engine. But it has more to offer than that. The most recent addition is FLV video grabber. This function will automatically detect if there is a webpage embedded video. If there is, IDM will display “Download This Video” button pop ups right in upper window of the current video. This is quite handy for you who frequently watch videos on YouTube, MySpaceTV, and any webpage that present you with videos even if it’s not video-based website. For you who don’t like watching movies over the internet, we guarantee you will have a new video downloading hobby instantly with this feature due to its very easy operation. IDM supports all popular web browsers ranging from Internet Explorer, Google Chrome, Mozilla Firefox, Netscape, Opera, to Apple Safari. If you initialize a download process from unknown web browser or even via an application, IDM’s advanced browser integration and application download request detection will automatically detect it. You must activate these functions first though in the settings menu. This will instantly takeover any download even if it’s initialized within an application. So for instance, you download a program like Yahoo Messenger or the like which send you an installation request package not a standalone package. 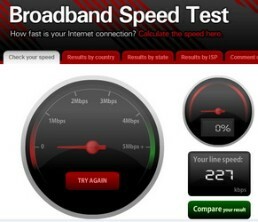 Normally it will download within its internal program and with slow download speed and no guarantee of undisrupted connection. With other download accelerator, you cannot do anything about it. But with IDM, you can take over the slow downloading process and replace it with a lightning speed one. This has never been seen before in any download accelerator and of course put IDM to the next level. In its settings, you can check or uncheck which browser you want IDM to takeover the download process when a request has been made. This is quite handy in case, in special occasion, you don’t want IDM to take over. Just like our case when downloading Adobe Digital Edition from within Adobe Reader. If we use IDM, the downloaded file would not be executable by itself even if it’s opened by Adobe Reader. So the download process should be handled by Adobe Reader itself. Another nice thing when downloading with IDM is that our downloaded file will be automatically organized using defined download categories such as movies, compressed files, programs, music, and documents. And you can define default folder to which your download files will be stored and organized. For malicious software safety, IDM can automatically run antivirus scanning when downloading and opening a downloaded file. Just set your antivirus in the option menu and you are ready to go. Ever have a time when you want to download several large files but you have to go somewhere and leave the downloading process? Well don’t worry, with scheduler function, Internet Download Manager can connect to internet at a specified time, download the file for you, disconnect your internet connection when it finished, and shut your computer down. The download queue list can also be used as an online synchronization. Another additional feature is a website grabber. This feature function will not only lets you download required files that are specified with filters, for example all pictures from a web site, or all audio files from a web site, but it also lets you download subsets of web sites, or complete web sites for mirroring or offline browsing. It’s very neat isn’t it? Before we continue to actually feel the speed of Internet Download Manager, we should explain first the principle that works behind Internet Download Manager. IDM will make sure all of your connection resources are made use. Thus it employs a mechanism called dynamic file segmentation. The file segmentation itself is not a new story behind download accelerator product. Basically it split the downloaded file into several pieces/segment according to how many connections available on the server. But what differentiate IDM with the rest of the bunch is that IDM segments this file not only before the downloading process but also during the downloading process. Hence, it is why it is called dynamic. This is important because when opening downloading request, it is still unclear how many connections available. Thus, it is only relevant to make the decision after the actual download process run and making use every available connection. Ok stop the mumbo jumbo, you might want an actual prove of what IDM can handle with your download process. At the time we were running our test, we use system with 2GHz Intel Celeron processor, 1 GB of RAM, and a 256Kbps wireless connection. We use this connection because we think it most represents the segment of those who need a download accelerator software. 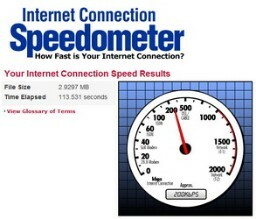 You can check our actual internet connection speed in the picture below. We also use the new Internet Explorer 8 which we believe have the refined download capability, making a comparison more actual and competitive between manual download and automatic one with IDM. Our first test is program download test. With no special reason, we target our web browser to TechSmith.com to download their SnagIt software, a screen capture application. 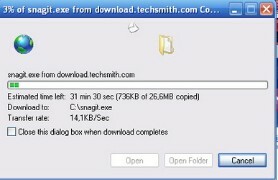 Without the help of IDM, we complete the download at 35 minutes and 15 seconds. While with the help of IDM we successfully achieve 14 minutes and 32 seconds. Don’t want to stop there, we conduct another test. 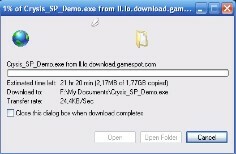 This time we download game demo from Gamespot.com, Crisis-Single Player Mode with file as large as 1.77GB. Without the help of IDM, we completed the test with 22 hours and 30 minutes. Yes it takes all day long. We put IDM to work and achieved 10 hours and 15 minutes. There, you save more than 12 hours! Please note that the two tests are conducted separately to prevent one process interferes the other. Second test is FLV video grabber. We download a Tomb Rider: Underworld trailer from Gamespot.com. And as you can see in the picture below, you have the choice to download the original MPEG file as large as 16.3MB or download the FLV video file that is extracted from the on screen video. Anyway you choose, the download process will be taken by IDM automatically. We complete the FLV video file download with 5.25MB file size with only 3 minutes time. FLV grabber also works with YouTube and other video-based website that does not directly give you a download link for their video. Please note that on certain occasion the pop up download button won’t show up until you click the play button on the video you want to download. Maybe this functions as a trigger for IDM to initialize a downloading process. Anyway as an addition, if IDM is too fast for you, you can use progressive downloading with quotas feature limits option to define number of megabytes per hour IDM can reach. This is useful if you use fair aces policy connection (FAP). At the end, as a conclusion, Internet Download Manager has proven its words in all of our key tests. It performs extremely well in downloading process. 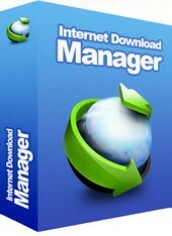 If you are frequently downloading files from the internet, Internet Download Manager is a must for you. Not only that it can save you two to five more time and save you from losing your downloaded file from any connection lost, but IDM also can manage and automate every download you do. Making your job a set and forget process. Overall, Internet Download Manager is absolutely an astounding product.